All federal election platforms are finally out (Conservatives, NDP, Liberal & Green). The Conservatives have also been running on Budget 2015, which they tabled in the spring. With these documents in hand, we can finally do an in-depth analysis of what the different parties have on offer. CCPA researchers have done some of this work already here, here, and here, and early in the campaign we released an income inequality platform based on our annual Alternative Federal Budget (AFB). The AFB is coordinated by the CCPA and is the result of collaborative deliberations amongst over a hundred civil society organizations representing millions of Canadians. It shows what the federal government could do if it decided to seriously address Canadians’ largest social, economic, and environmental concerns. Instead of providing my own opinion on each platform, I grade the platforms based on how much they overlap with the standard of progressive policy: the 2015 Alternative Federal Budget (AFB). With that in mind, drum roll please…. Now, there are actually many good ideas in the party platforms that aren’t in the AFB, such as the Green plan to legalize and tax marijuana, or the Liberal and NDP promises to crack down on small business tax loopholes. But if the proposal wasn’t in AFB 2015, these campaign pledges get a score of zero. For the sake of consistency, I only evaluate the overlap between each platform and the AFB. The scoring includes both revenue and expenditure items. Overlap with each of the AFB’s 90 program lines can earn a maximum score of three (3). Some programs, like a carbon tax, are worth far more money ($22 bil) than others, like an inquiry into missing and murdered Aboriginal women ($10 mil), but still platforms can only get a maximum of three on either, irrespective of their dollar value. As fully costed as the parties claim their platforms are, we did not want to make this test too difficult, so the scoring is out of 90 points. In other words, if a platform simply mentioned every AFB program item (with some costing) it would earn 90 out of 90, an A+ , based on the current grading scheme at my alma mater, the University of Windsor. Theoretically, based on this scheme, a party could score higher than 90 (if, on enough AFB items, they spent less than half of our proposed funding levels). Is the above marking scheme somewhat arbitrary? You betcha. But it manages to reduce the complexity of each platform to a single, seemingly value-neutral number, which, as an economist, is deeply satisfying. If you get excited (like I do) about comparing the actual spending on a year-by-year basis, platform by platform, you can see my spreadsheet here.
? Which Party Will Bring Military Spending Under Control? This essentially says that a bunch of NDPers got together and designed an alternative budget. Then did a news release saying the budget of the NDP best reflects their thoughts in the alternative budget. True. But of course it doesn’t take into account any items that were not in the original budget. So a progressive idea only counts of the NDPers in the CCPA thought of it first. I can see how this system would appeal to you folks. I can see a big future in electoral politics for many of you. I used to send you folks money. Then I realized you were simply a branch of the NDP. So I stopped. If I want to contribute to the NDP, I will donate directly. Well I wish the list of AFB authors were some sort of nefarious secret society. Unfortunately, we’re pretty transparent about the whole thing. You can read who contributed to the AFB in the acknowledgements of the AFB each year (its at the back). None of them are from the NDP. Now the NDP (and Liberals and Greens) likely look at the AFB, sometimes they ask us for policy advice and we give it. We’d give it to the Conservatives as well, but they don’t ask often. Interestingly the Liberals and the NDP were quite close in this ranking prior to the release of the full NDP platform last week when we got more detailed program costing. David Hall obviously missed the point that the comparison is with a “progressive” platform. Perhaps a definition may be helpful. It seems that if the CCPA didn’t think of it, it doesn’t count. Clearly the Green thinking is way out in front of where CCPA is, and in this slanted system they are penalized for it. This is hardly what one could call an objective evaluation, as there are too many biases in the methodology. Well I’d love to see an “objective” evaluation of progressivity in the platforms that isn’t “biased”. I’m quite upfront that if it’s not in the AFB it doesn’t get points, despite there being good ideas in the platforms. That’s definitely a bias, but the AFB is a public document that came out prior to the platforms, so its easier for others to check my work. If the Greens have great ideas not in the AFB, please let me know what they are as we’ll see about incorporating them in next year’s AFB. 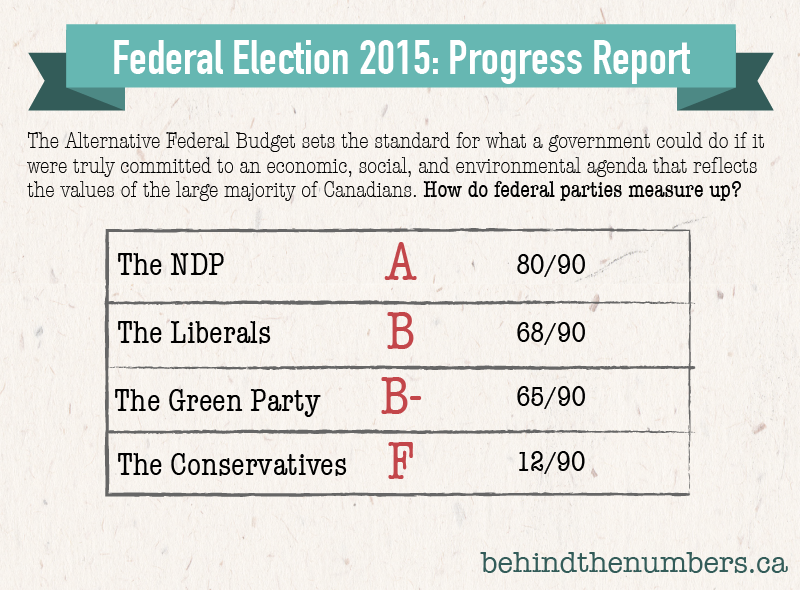 Hint: Guaranteed Annual Income is actually not in the Greens costed plan (check it out at http://www.greenparty.ca/en/budget) but they got 3s across the board in environmental policy in terms of AFB match up. See my spreadsheet. The Liberal ‘platform’ is a mirage. The probability of the Liberal platform being executed is nil unless there is a New Democrat government or a Liberal minority with the New Democrats pushing it. Left on their own the Liberals have always shied away from implementing progressive policies – which mutes your exercise somewhat. Ontario and British Columbia are obvious Liberal gov’t examples but even the old federal Liberal governments were all about austerity even though they campaigned on progressive values ( the Red book). WOW – talk about a bunch of cynical commenters!! All I think, except for Mr Llewellyn . I guess I can’t really blame them for being so cynical – looking at the bullschitt lies and cheating we’ve all seen in the last ten years, and performed right before our very eyes! I keep that old saying in mind: “Pray to God, but row to shore” – means- don’t just sit on your hands, pray God has it under control – Do Your Share of the Work!! I did, I have, now all I can do is wait ……. for the outcome. Best (IMO) would be the NDP to form govt. 2nd would be the LPC, not because I want them, but because I so want rid of the #HeilHarper thugs! So, I hope this bit of optimism will help some others to do more than just pray! IOW – Get out there and vote on the 19th!! I’m with Cheena Graham. The best governements are minority because everybody has to work together to get anything done. I have reviewed the supporting spreadsheet. The NDP are rated in 44 categories, the Greens in 28, yet the totals are simply added. You are not an amateur so I can only deduct that this report was designed to favor the NDP. David Macdonald: please explain this. Well, you can get points in any category where you overlap with the AFB. A good example of this is Foreign Aid, the NDP has made a (small) commitment on this front, the Greens have made no commitment. So the NDP gets 1 the Greens get 0. On the other side, the Greens get 3 on their carbon cheques, a full overlap whereas the NDP gets 0, no overlap. Now as to averaging only the areas where there is overlap (as you suggest), that would be like getting a mark on a test based only on the questions you decided to answer and excluding the questions you didn’t answer, not generally how tests are marked. Another way of describing what you’re seeing between the Greens and the NDP is that where the Greens overlap with the AFB, they overlap strongly. But their overlap is very concentrated in a few areas, notably environmental policy. The NDP on the other hand, overlap on many more points of the AFB, just at lower dollar commitments. When combining those two factors, the NDP’s broader overlap overcomes their lower dollar commitments compared to the AFB. This seems a little disingenuous. You said that “if a platform simply mentioned every AFB program item (with some costing) it would earn 90 out of 90, an A+”. In your test example that would be like saying that you answered a question with “I don’t know the answer but it’s more than 0” you would get 1 point whereas if you just leave it blank, you get 0. Now, if you change your rating scheme to give 0, 1 or 2 points instead of 1, 2, or 3 it is very interesting that NDP, Liberal and Green end up tied with 36 points and Conservative gets 1 point. In fact this makes way more sense. I would also point out that your ABC Grade Scheme is totally invalid. You rate the scores out of 90 and yet your own AFB would score 3 in each category for a score of 270 which is out of your grading scheme. Your scoring system is flawed, your grade scheme is broken and the damage has been done. Those who benefit from it are showing off the results graphic without any analysis of methodology and, I might add, without any disclaimer saying that the scoring mechanism is totally unscientific. The AFB scored using your methodology would score 270/90. This suggests that the grading scheme is flawed. Governments rarely, if ever, implement their parties full platform. The not so-Progressive Conservatives have implemented a far more radical agenda than the party’s platform calls for. Therefore, realistically, their score comes out too high. What about poverty? THE CANADA POVERTY POLICY AUDIT ELECTION 2015 evaluates the four main party platforms for their potential to lessen poverty. WHY POVERTY? WHY NOW? WHY ACADEMICS? It is now widely acknowledged that Canada, like many other wealthy countries, has seen significant increases in poverty and inequality over the last few decades. Yet this has scarcely been mentioned by Canada’s political parties during the 2015 election. The focus of the Party leaders on “middle class families” reflects the stagnation of mid-range incomes, and the pressure and debt those families face. That is an important issue. However, there is another growing group of people who are worse off. These are the poor, both working and non-working, who find their chances in life significantly restricted. Canada is ranked twenty-fourth of thirty-five OECD countries in terms of poverty; it is ranked by UNICEF as seventeenth of twenty-nine wealthy countries. Child poverty has actually become worse since Canada adopted a resolution in 2000 to end child poverty. “No poverty” and “zero hunger” are the first and second of the newly adopted UN Sustainable Development Goals. The goals are meant to apply around the globe, including poor and developing countries, yet Canada as a wealthy developed country has significant poverty, relative to ordinary Canadian expectations, and even hunger. This Audit is a project of the Canadian chapter of Academics Stand Against Poverty (ASAP). ASAP is a group of academics and students who work to synthesize and distribute expertise about poverty reduction or eradication, with a view to increasing the impact of expertise on policy makers and the public. The word “audit” is used for its consistency with neutrality. The goal is a non-partisan analysis of party platforms in different areas, for their potential impact on lessening poverty. Audited parties are: Liberals, Conservatives, New Democrats, and Greens. Each Audit is written by an academic with expertise in the area, or someone with comparable credentials, and is also peer reviewed by one or more persons with expertise in that area. We believe that public policy can lessen, ameliorate, or even eradicate poverty in a highly developed country such as Canada, since poverty is not natural or inevitable. Poverty not only is not inevitable, but it is also amenable to research-based knowledge reflected in public policy. Research can tell us a great deal about the social and economic factors that put particular people or groups into poverty. Research also can tell us how particular policies are affecting people and if they are having the desired results. However, this will not happen without the political will of the governing party and the support of Canadians. This is why this project is done during an election period. Resistance to the idea of tackling poverty with public policy is sometimes found to be based on attitudes of blaming the poor for being poor. This often intersects with prejudicial attitudes based on race, gender, or culture. The general level of well-being of identifiable groups (e.g. indigenous, racial, gender, or ethnic groups) can be a key factor affecting individual well-being. However, prejudicial attitudes also can be identified and analyzed by research. We believe it is reasonable to think that all people desire a life that is not limited by poverty. What is poverty? Another source of resistance to the idea of tackling poverty with public policy is the view that it is extremely difficult to measure or define poverty. Scholarship, both Canadian and international, currently reflects the view that poverty is not simply a measure of income, but is multi-dimensional. Poverty is almost always a matter of low income combined with social deprivation and/or exclusion of one kind or another. Issues of social deprivation or exclusion can be addressed with a range of policies in different areas. Lessening poverty does not only involve increasing income transfers, but also improving inclusion and a sense of belonging for all Canadians and indigenous persons. The goal of developing reasonable measures of well-being is itself part of current scholarship about poverty, both nationally and internationally. The government of Canada is far and away the most well positioned body in the country to support research on the causes and remedies for poverty as well as for social deprivation and exclusion. It is also, of course, the central body to take action to bring about a more inclusive Canada. This is why the “Poverty Policy Audit” is aimed at federal party election platforms. Although auditors say almost nothing about values or ideology, it is clear from the audits that the parties differ greatly in their views about the proper role of government. It also appears that every auditor finds the least confidence in the Conservative Party that its policies would reduce poverty, compared to the other parties. Read the audits to find out why. FINAL RATING: Auditors were asked to respond to the question: “Do the platforms of each party provide you with confidence that the party’s policies, in your research area, will lessen poverty among Canadians? Women and Poverty	Not rated. The highest possible score is forty (40); the lowest possible score is eight (8). INCOME SECURITY, HOUSING AND HOMELESSNESS, WOMEN AND POVERTY, EARLY CHILDHOOD EDUCATION AND CARE, INDIGENOUS PEOPLES, IMMIGRANTS, HEALTH. Full Audit available shortly at academicsstand.org, or email the lead to receive it. Interesting . By concentrating only on costed items in the AFB, this discussion of “progressive” managed to leave out “trade deals” (really, corporate bills of rights) which undoubtedly constitute one of “Canadians’ largest social, economic, and environmental concerns.” While not “costed” in their economic platforms, the costs of not opposing these deals are enormous, and arguably outweigh many other factors studied, in terms of job loss and loss of economic sovereignty. Although the NDP eventually joined the Greens in opposing the TPP (so they both clearly outrank the Liberals on this dimension), the most progressive position is one which the NDP shies away from espousing. What Canadians really need is a party that opposes any deal which gives corporations more rights to sue our governments than we do to elect governments to make economic policy. Otherwise, it will ultimately matter little what we put in the AFB or indeed the “real” FB, because our governments will have given up real economic power to the corporations.